Do you have a favorite hunting or fishing story? You can share yours and read some from other Minnesotans here! "In Ann Arbor, about 1956, was pheasant hunting for the first time. My companion, a seasoned hunter, saw a flash of green in the shrubbery, and shot ... a drake mallard. He bought a duck stamp next day." — Evan Hazard, Bemidji, Minn.
"The year I thought I shot five wood ducks in one shot and turned out to be five filthy mergansers." — Mark Hayes, Buffalo, Minn.
"The great thing about hunting is that every outing creates more stories. One story in particular comes to mind. Many years ago, I went duck hunting with my oldest brother and my dad at our favorite spot on some public land in Sterns Co. We spent the early hours shooting in the general direction of the ducks that flew by, but I don’t think we had much to show for our efforts. That day also happened to be the pheasant opener. So, later on when the official time came, we doffed our camo and donned our blaze orange. Then we stepped out of the swamp and into the surrounding fields for pheasants. We coursed the field three across — my dad on the far right, my brother and his golden retriever in the middle, and me on the left. After about an hour of walking back and forth, we were approaching the swamp again, not far from our blind, when a bird jumped up right in front of me. "Hunting is my heritage and is a very important tradition and in both my private and professional life. ... Getting up early, helping with the milking chores, and then sneaking through the woods behind the barn with my dog to jump-shoot puddle ducks like wood ducks, blue-winged teal and mallards. And every once in a while I managed to bring one or two home." — Blane Klemek, Becida, Minn.
"I can hunt from my back door as I live along a wetland in the northwoods. I don't go far. Years ago, I was walking with my shotgun in hand, along the banks of the creek that flows through our place, when two mallards suddenly flew up. I instinctively swung the gun up and shot them both, one then the other. What I completely forgot was that I was walking near the corral where we had just put our Arabian mare and foal the day before, and at the shots they bolted through the poplar rail fence, the mare striking the wood rails with her chest, breaking them, and the foal, somersaulting end over end and back up on its feet, both of them at full gallop like a gymnasts completing an exercise. I felt sooo bad! I had never given them a thought, so entranced as I was possibly seeing a duck to shoot. "There are so many stories, so many great experiences with friends, families and duck dogs. There have been so many great days, with weather, wind and waterfowl. There have been so many great places — quiet, secluded, lonely lakes, rivers and sloughs. All of those factors are integral to a great hunt. 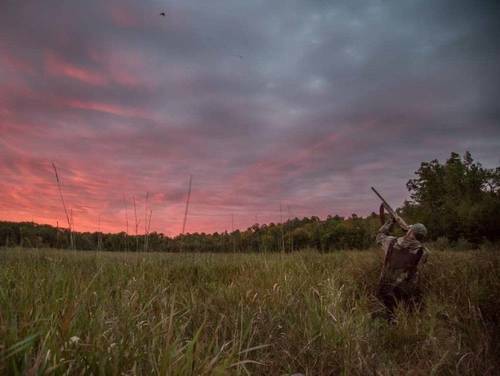 And I've been fortunate enough to have experienced hundreds of mornings in the duck blind, and a few mornings where all those factors have come together perfectly for a memorable hunt.